The bad news: you’re gonna die. The good news: there’s a shton of sweet Detroit foods to eat before you do, which is why we’ve created the ultimate Detroit food bucket list -- a round-up of 50 local dishes you must eat before… well, you know. Just do us a favor, and don’t eat ‘em all at once... we don’t want said list being the (ironic) reason you kick said bucket. 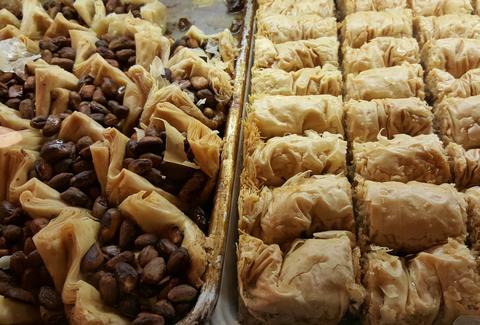 Greek food is as easy to find in Detroit as the ubiquitous coney dog -- actually, technically, the coney dog IS a Greek in origin -- and there's good baklava to be found in damn near every bakery. But Astoria Pastry Shop is the OG of local Greek bakeries, and certainly the most popular. Ball Park Franks were created in Detroit specifically for the Detroit Tigers, and they have since become synonymous with all things baseball, backyard barbecues, and summer. 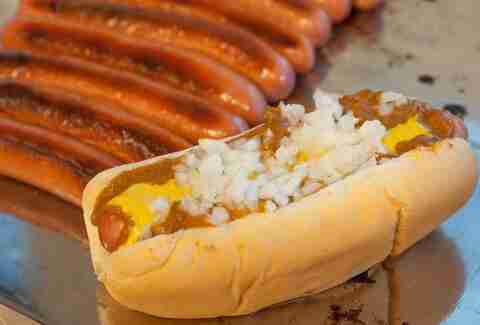 Eat it with just the mustard as the meat gods intended, and wash it down with something from Comerica Park's stellar Michigan craft beer selection, because it's 2015 and we don’t have to live like savages anymore. Detroit? Vegan? Soul? These three words did not go together in the same sentence until just a few short years ago, when Detroit Vegan Soul came on the scene to show us all that a 100% plant-based diet can be 100% delicious. 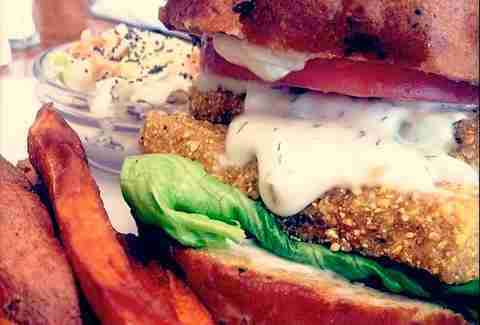 Their cornmeal-battered tofu will definitely NOT having you missing catfish. Traffic Jam is the most hyper-local restaurant in the city with their own bakery, garden brewery, and creamery all on their property. The latter is kicking out one of the best Michigan-made cheeses out there: the award-winning blue asiago cheese. It's not available all the time, but when it is, buy up every single wedge of it; it's one of the few cheeses made locally that can compete on a national level. 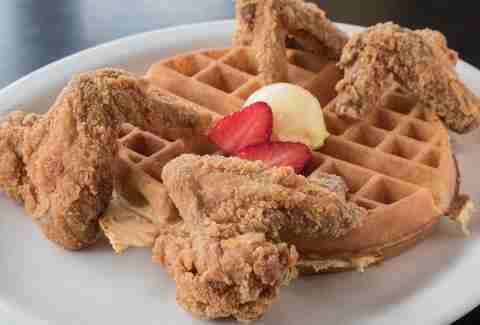 There are several places that specialize in chicken and waffles, but New Center Eatery is the tried-and-true long-time favorite, even pre-dating the Columbusing. Even though Avalon's organic and socially conscious thunder has been stolen by many other food businesses implementing the same practices, those chocolate chip sea salt cookies have stood the test of time as something worth waiting in that stupid line for. Detroit is corned beef country, being the home of Sy Ginsberg's famed corned beef and all. There are lots and lots of places to get an authentic Sy Ginsberg corned beef sandwich in town, but we like to stick with Detroit's favorite deli, Mudgie's, and order up a Barrett with that famous corned beef, creamy coleslaw, Swiss cheese, and thousand island dressing on an onion roll, served warm. Pro tip: Mudgie's also has one of the best bottled beer selections in the city. Detroit's one and only artisan sausage-maker is also a vendor at Ford Field, and while you can buy Corridor Sausage products to make at home, nothing beats trying them the way their creator intended: at a major sporting event with an overpriced beer. 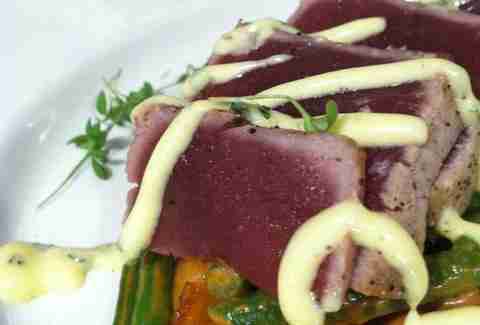 Le Petit Zinc in Corktown is about as close to a French-style bistro as you'll find here in the Paris of the Midwest. 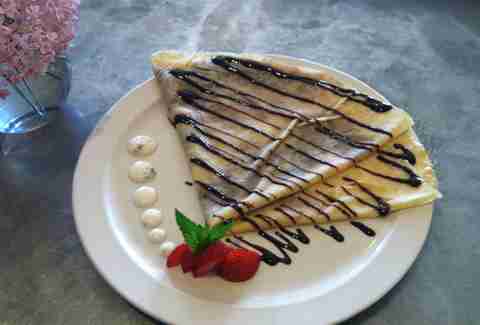 A coffee and a crepe here is a must, but resist the urge to order up a chocolate-covered confectionary crepe and try something savory, like the olive oil and rosemary marinated goat cheese with spinach and pine nuts. It's not called "Detroit-style deep dish" for naught – the dense squares of caramelized cheese-coated delights makes Chicago's glorified casseroles look like…well, glorified casseroles. Buddy's Pizza is the original, but Jet's is the truth. 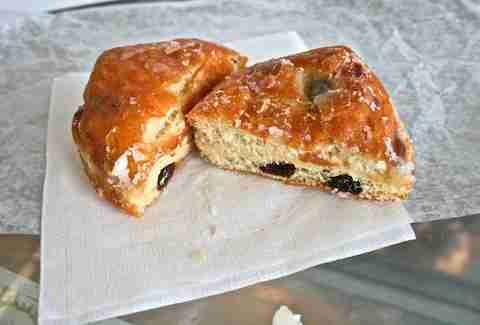 You have not earned your Detroit badge until you have ordered glazed blueberry doughnuts through bulletproof glass. 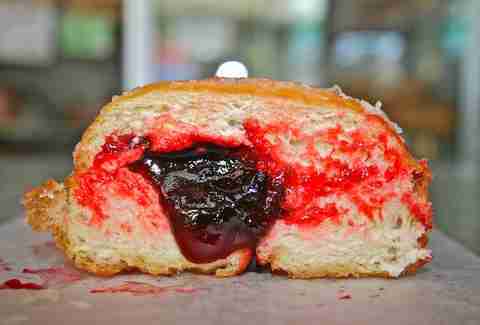 Dutch Girl Donuts is a Detroit institution, open since 1947. It's a new Detroit classic, it's under $5, and it's awesome. 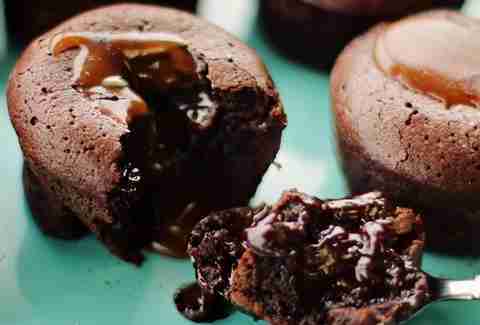 Pair with Astro's flat white, and it becomes divine. 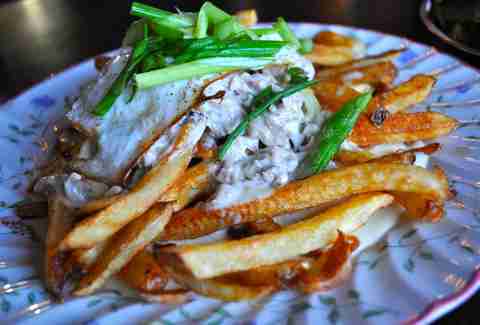 Scotty Simpson's fish and chips are a timeless dish served in a place that time hasn't touched. 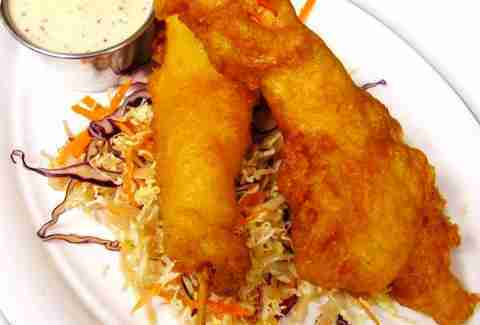 Made with fresh cod flown in daily from Nova Scotia and hand-cut Idaho potatoes, these fish and chips are the real deal. Fairly new to the local food scene, the authentic -- made by a French person! From France! -- lava cakes from Chez Chloe are hands-down the richest, most decadent, most transcendent dessert in Detroit. Pollo Chapin is Southern soul food meets Mexico, and no, that doesn't need to make sense for them to make the best damn fried chicken in Detroit. Which they do. There are many, many homemade items to recommend at Giovanni's, including all of the pasta -- but that garlic bread, tho. If you should never eat another carb again, let this one be your last to forever remember them by. Leo's "famous" Greek salad is a heaping bowl of iceberg non-lettuce (though you can get it with spinach instead! ), tomato, cucumber, pepperoncini, Greek olives, beets, chickpeas, and Leo's own Greek dressing, which you can also take home by the bottle. We could all argue all day about which gyro is the best, but the obvious and definitive answer is Golden Fleece, where the lamb meat is cooked on a spit at the front of the restaurant and hacked off for your eating pleasure when you order. At Mike's Famous Ham Place, you can get ham, or ham, or ham. Or ham. And you know when a place does only one thing, and has done that one thing for decades, that one thing has got to be pretty damn good. The hani is basically a chicken finger sandwich wrapped in a fluffy pita with American and Swiss cheese, tomatoes, lettuce, and mayo. There is nothing remarkably cutting edge about this dish, except for that it always seems to hit the spot and it's all ours. For proof, trying ordering a "hani" anywhere else in the country. Oh right, you can’t. There is a disproportionately awesome amount of good pizza in Detroit, and Motor City Brewing Works is the proud purveyor of some of it. You really can't go wrong with any of their brick oven pizza creations, but "Mary Did Have," their Mediterranean flavor-inspired lamb pizza, is everything you love about our local abundance of Mediterranean food (Greek, Lebanese) on a pizza instead of a pita. The pizza crust is an even better delivery mechanism for the lamb, tbh. 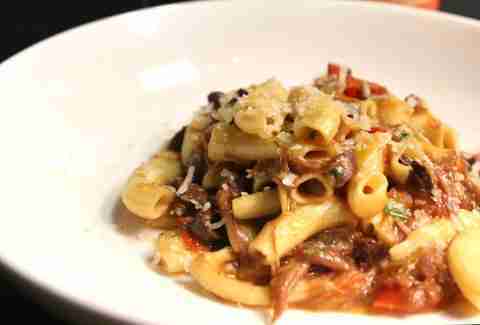 The "newest" item on this list, Andy Hollyday's lamb ragu is already legendary in Detroit. He first introduced it during his tenure at Roast, and in the opinion of certain circles (cough) it was the best thing on the menu there. He has kept it alive on the menu at the heavily Italian-inspired Selden Standard, and we can all rejoice. Once upon a time one of the best/trendiest restaurants in Detroit was Coach Insignia, and once upon a time one of the most exciting dishes in the city was their fried lobster corn dog with Asian cabbage slaw and stone-ground honey mustard. Back in the days of CityFest (remember that???? ), this lobster corn dog would get a line an hour long and people would talk about it all year in anxious anticipation of the next CityFest. Of course they could have just gone to the restaurant… and 10 years later, so can you. Slows is a barbecue restaurant most famous for its mac and cheese, and that’s fine, because that fame kickstarted everything that we know Corktown -- and, by extension, the rest of Detroit -- to be today. It has been written up in Bon Appetit and the New York Times and everywhere else and, you know, despite the Detroit instinct to disparage anything that gets a little TOO big, it really is pretty damn tasty, celery salt and all. What do you eat when you're on Detroit's east side at a Belgian bar drinking Belgian beer and playing a Belgian version of bowling? You eat mussels by the bucket, obviously. Available in multiple preparations including the classic white wine and vegetables, Italian marinara sauce, and garlic with white wine and olive oil, mussels and feather bowling at Cadieux Café is a quintessential Detroit experience. Obviously you don't really need us to tell you about Green Dot's famed $3 "mystery meat" sliders, so we'll just go ahead and reiterate: from beef heart to bull testicles, the mystery meat can be just about ANYTHING, and is yet another mandatory Detroit food checklist item. They're available year-round at New Palace -- really! -- so you don't have to line up on that ONE day for three hours, in order to get in on a phenomenon that most of the rest of the country has never even heard of. Hit up Polish Village Café for a pierogi platter with potato, kraut, sweet cheese, potato and cheese, blueberry, and/or strawberry pierogi. You never know what you're going to get with Supino's daily slice special, but you can bank that it's probably going to be something awesome -- this is, after all, one of the best pizzerias in America. With locally-made ingredients, and ingredients sourced fresh from Eastern Market, the special is ever-changing and always worth ducking in for. 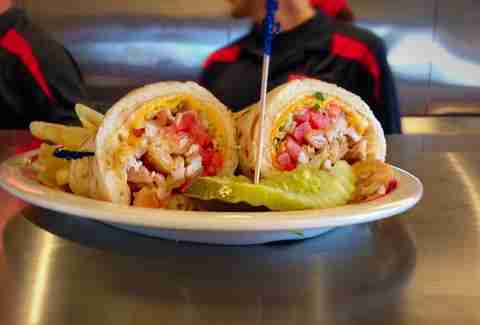 The hearty and healthy pocket sandwich at Goodwell's has long been a favorite among Detroiters who know. Made from a vegetarian soy patty and a whole garden stuffed into a whole wheat pita pocket, if you're looking for something healthy but filling, high-quality but low-cost, look no further. They were already winning with Nicole's Poutine (made with duck gravy), and then they upped the ante by offering a fried egg on it, and now there's Nicole's Poutine Part Two, a ramped-up adrenaline fueled sequel to the already terrific traditional version, turned up to 11 with the addition of brisket and bleu cheese. Pupusas! Ah hahahahahahaha…hahahahahaha!!!!! Ahhhhhh it's a funny word. They're also really tasty, and really cheap. Get the pork, beans and cheese. Scott Moloney's artisan ice cream shop has always been known for kooky experimental flavors, but one mainstay that has been around since the beginning is the salted caramel ice cream, and it's his biggest seller. Take a duck egg. Wrap it in sausage. Deep-fry it. That is the Scotch duck egg at St. Cece's, and also it pairs really well with Michigan beer and a wood-burning fireplace, just so you know. 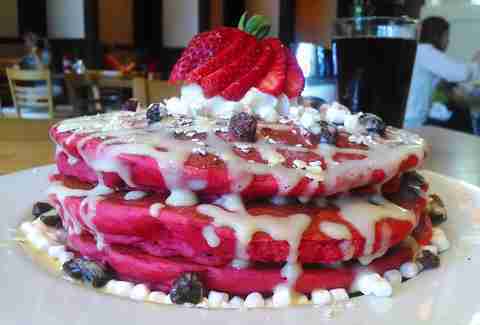 These red velvet pancakes have been often imitated since Hudson Café first opened its doors, but make no mistake: these are the original, and the best. That cloud of smoke you see hovering over the western edge of Eastern Market on Saturdays comes from ribbers' row, all those dudes you see standing out there with grills cooking up delicious meats while people sing karaoke surprisingly well every week. There are other places you can ORDER barbecue, but there are no other places where you can EXPERIENCE barbecue. The roasted bone marrow at Roast marked a turning point for Detroit food (as did pretty much everything else at Roast, including the burger). This meat butter is served on a sawed off bone, so you can shoot it like a beef oyster if that's what you really wanted to do. Doused heavily with brandy and lemon, diner saganaki is THE saganaki to experience in metro Detroit, and Little Daddy's is a great place to start. GARLIC. That is all. 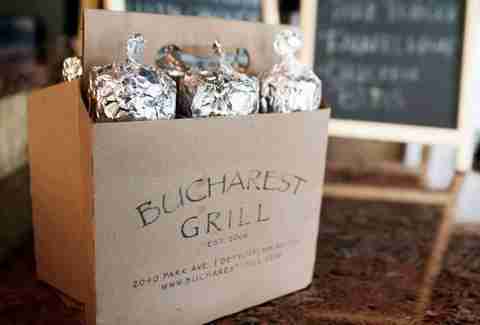 Okay, that's not all -- Bucharest Grill makes the most famous sandwich in Detroit, and that is because of GARLIC. For as long as Detroiters have been eating, we've been eating sliders. It sure seems that way, anyway. We certainly have a lot of historic old white box slider joints that we're all very partial to, but Telway beats all for nostalgic purposes and for $3 sacks of sliders. They've been in business since 1988 serving every kind of sweet potato concoction imaginable, from cakes to cookies to cobblers. In this case, though, stick with a classic -- the sweet potato pie. Top it off with some of their sweet potato ice cream just for funsies. Back when the London Chop House was the grand dame of Detroit dining, drawing in power players and celebrities from all over the country, the kind of fussy quasi-French high-end steakhouse fare that it specialized in was considered de rigueur, from Oysters Rockefeller to full caviar service. A visit here is a throwback in the best possible kind of way, as is the steak tartare, made with porcini vinaigrette, truffle, and a soft-poached egg, this is early-to-mid-19th century decadence at its finest. We don't have a Shake Shack, and quite frankly, we don't need one. Why? Because the best thing at Shake Shack is the burger stuffed with molten cheese, and we already have that at Cutter's for half the price. Try it stuffed with cheddar cheese and bacon. La Dolce Vita is an Italian restaurant, but people really aren't going there for the French food. They're going for the incredible patio, called an "urban oasis" so many times there is no longer any need to, and for the bottomless mimosa brunch with the mascarpone-stuffed French toast topped with sautéed bananas. 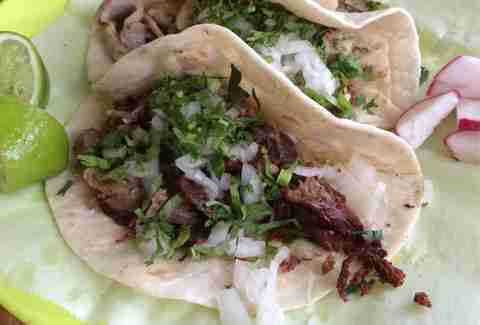 There are lots and lots of tacos -- SO many tacos, in fact, that it's not even possible to name which are THE best. You can't really go wrong with most Southwest Detroit taquerias (heck, even the trucks set up in gas station parking lots are pretty great), but Taqueria El Rey certainly doesn't disappoint with its diversity of offerings, which include the standard al pastor and carnitas as well as the less-standard cabeza and barbacoa. As previously noted, when one goes to a place with "tamales" in the name, one orders the tamales. Conversely, when one desires tamales, one goes to the place with "tamales" in the names. Evie's Tamales are a local favorite, and not just because they are 85 cents each or six for $4.50. Be sure to pre-order for the holidays! You can get a giant smoked turkey leg in Detroit. And therefore should. You can also get turkey bites and turkey dinners, but the giant smoked leg is where it's really at. Tres leches = sponge cake soaked in evaporated milk, condensed milk, and heavy cream. 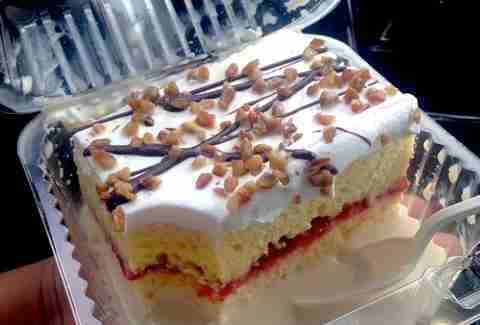 We're lucky here that we have so many great Mexican bakeries with so many great Mexican desserts, but tres leches beats all, and Sheila's Bakery makes the best. Sweetwater Tavern serves the most famous chicken wings in Detroit: big, meaty, Amish wings sourced fresh from Eastern Market daily and then marinated overnight, dredged in their secret blend of spices, and fried for your eating pleasure.